This book is a chronological review of the year 1969. 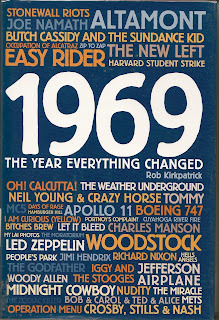 With so much having been written about 1968, sometimes 1969 gets lost in the shuffle. 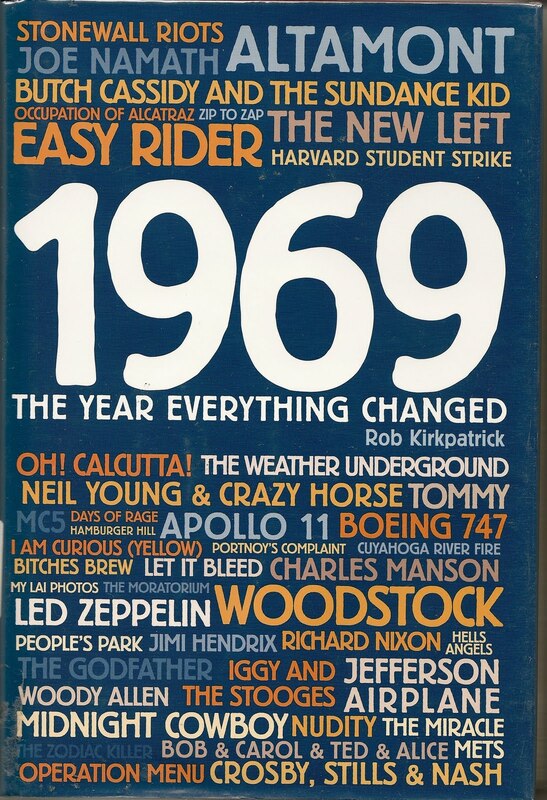 I have always considered 1969 to be the year that the "Woodstock Nation" died. The era of peace and love sort of ended at Altamont Speedway in California that December when the Rolling Stones hired the Hells Angels to be the "security" for the concert. A crowd of over 500,000 people allowed themselves to be intimidated by less than a couple of hundred bikers. The fact that someone was murdered in front of the stage, while the Rolling Stones kept playing, underscores the myriad of problems which plagued our society throughout the 60's and would spill over into the 70's. Some might say that the seeds for some of todays problems were planted back then. The year itself was just as exciting as 1968, but in a different sort of way. While 1968 was a year of great hope, 1969 was a year when the "hippie" movement clearly became commercial. Capitilizing on the sexual revolution, "O! Calcutta" became the number 1 show on Broadway. "I Am Curious (Yellow)" was considered a landmark movie. In California Charles Manson was able to use the mind expanding properties of LSD to control a band of followers, directing them to murder for the dubious purpose of inciting a race war. San Francisco was reeling under the threat of the "Zodiac" killer, while Lt. William Calley was charged for his role in the systematic killings of unarmed women and children in My Lai, Vietnam. In politics, President Nixon was in office and beginning his slow descent to his place in history. Ted Kennedy was busy partying with his own campaign staff and made his famous "swim" against unbeatable currents, leaving Mary Jo Kopechne to die, trapped in his car at the bottom of Chappaquiddick. Although this would end his hopes of ever becoming President, it had no effect on his position as head of the Senate Ethics Committee, a post he would occupy for 41 more years, until his death in 2010. In the midst of all of this there were some very positive things going on as well. Man landed on the Moon, and the first Boeing 747 "jumbo jet" took flight, enabling more people than ever before to travel at an affordable rate. Gays grew tired of being harassed for their sexual orientation and fought back against police in New York City's Greenwich Village, in what would become known as the "Stonewall Riots." This would be the beginning of the Gay Rights Movement. The Arts and Music scene were active. The Who released the first so-called rock opera, "Tommy." Neil Young and Steve Stills left Buffalo Springfield to form their own bands. Neil Young formed Crazy Horse and Steve Stills founded Crosby, Stills and Nash, which Neil Young would later join. The book is augmented by a time line showing the news events of the year. And it was a busy one. Reading this book makes you aware that 1969 was not only the turning point of a decade, but also a watershed year, both in who we were and what we have, as a society, become.